Documentary filmmaking is a tremendous social vehicle. It can generate the necessary impact when wielded by capable, intellectual minds that cannot abide with injustice. Anand Patwardhan has achieved the esteemed status of being India’s premier documentary filmmaker, making the medium a bulwark of social justice and questioning motives behind certain political agenda. Despite constantly being up at arms with the Indian Censor Board and the Government, the filmmaker has established an unshakeable foundation of social activism via documentaries. and civil liberties during the course of the 1975-77 Emergency and after it. These are but two examples cited. He is a man who is driven to make a difference. Prior to the 2014 elections to the Lok Sabha, Patwardhan made his presence felt at Carmel College of Arts, Science and Commerce for Women, Nuvem, Goa, for the screening of In the Name of God or Ram Ke Naam. The documentary though mired in controversy and vehemently opposed by the political upper echelons, has the Patwardhan trademark of being brutally honest and hits at sensibilities to incite protest against gross injustice. Patwardhan says, ‘The purpose of the documentary is to help people understand the dangers of communalism. Initially, the Censor Board would not allow the screening.’ Although the documentary was telecasted later by Doordarshan (1997) but only after Patwardhan went to court to redeem it. ‘But by that time Babri Masjid fell and the repercussions are still suffered in our country,’ he continues. He notes that the Allahabad High Court recognized Ram as a litigant in the Ayodhya title suit hinting at the absurdity of a judicial system tainted by hidden fundamentalism. The 1991 documentary which was only released on September 18, 1992, made waves at international and national awards and film festivals in 1995, garnering the National Award for Best Investigative Documentary, India; the National Award for Best Social Documentary, India; the First Prize, Jerusalem International Film Festival, Israel and the Special Jury Prize, Vancouver International Film Festival, to mention a few. In the Name of God traces L. K. Advani’s infamous rath yatra from its proclamation to the violence in Ayodhya on October 30, 1992. Patwardhan tells us that it was the rumour spread by the wily British in attempt to enforce the policy of divide and rule that Babur had broken down the original temple of Ram. The fact remains that Babri Masjid was constructed in 1528. ‘The Ram cult spread only after Tulsidas’ Ramayan came into existence that is fifty years later,’ he corroborates a statement made in the film. In spite of this Muslims and Hindus worshipped side by side in mutual compromise. But this came to an end in 1949 when idols of Ram were placed within the mosque by Mahant Shastri and others. The District Magistrate, K.K. Nayar refused to take any action, siding with the fundamentalists. 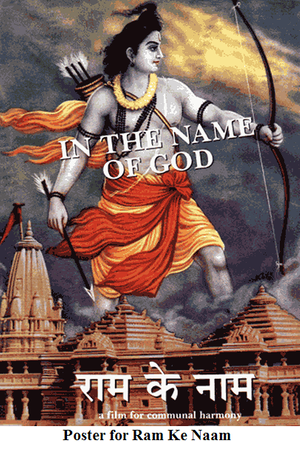 Propaganda that Ram had appeared at his birthplace in Ayodhya further fuelled communal sentiments. In the documentary, Pujari Laldas, who was appointed priest at the Ramjanmabhoomi Temple by the court, was vociferous in his disdain for the actions of Hindu fundamentalist groups. Muslim rulers had donated land for Hindu temples but this was conveniently ignored. He considered it a political game to cash in votes with no concern for the genocide that could ensue. This idea was eventually proved true with the BJP coming into power in the Uttar Pradesh Assembly in the following elections. Pujari Laldas was murdered in 1993. No doubt this crime was the action of the disgruntled propagators of Hindutva. The VHP (Vishwa Hindu Parishad) has allegedly never worshipped at the temple but amassed an enormous amount of wealth through numerous donations. With branches all over the world, the clout this organisation possesses was enough to squash any inquiry regarding tax evasion. It only goes to prove that corruption exists within all political parties and organisations. It is not just openly fundamentalist political parties that have tried to prevent the screening of In the Name of God but others as well. Latent pro-Hindutva leaders exist within the fold of the Congress Party too. In the present scenario, BJP has ridden to victory backed by industrialists who hope to benefit from their win. The media, controlled by prominent business houses, has no doubt played its role in enabling the BJP victory. It is ironical that the upholders of Hindutva, when questioned in the documentary, could not even name the century Ram was born in. The callous attitude of highly educated political leaders belonging to the BJP, turning a blind eye to the trail of bloodshed left behind, and the gullible acceptance of their ideology by the so called educated middle class, makes one rethink the value of education. If education is the instrument to broaden minds and infuse good sense then it has sadly failed us in India. The uneducated and lower caste individuals have a better grasp of reality and are thoroughly practical in their outlook with a clear sense of right and wrong. ‘Communalism is more among the educated, urban class than villagers and the dalit class,’ says Patwardhan. ‘Education does not teach you to become a better human being. It is only a matter of reading and writing, and obtaining a job. What we need is Mahatma Gandhi’s Naye Taleem to teach individuals to become better human beings,’ he adds. The power of the documentary can be seen in the efforts made to prevent the public from viewing it. The bare truth that it lays out has managed to dissuade kar sevaks who saw it from their destructive path, and veer from their focus on Hindutva. 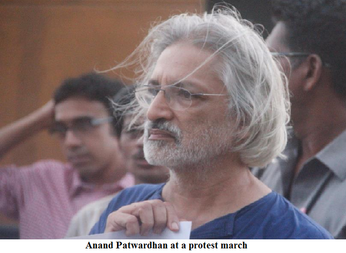 Patwardhan took it upon himself to enlighten people through private screenings before the elections. Unfortunately, what little he could do was not enough as evinced by the outcome. The warning bell has been sounded. Now we await the inevitable.